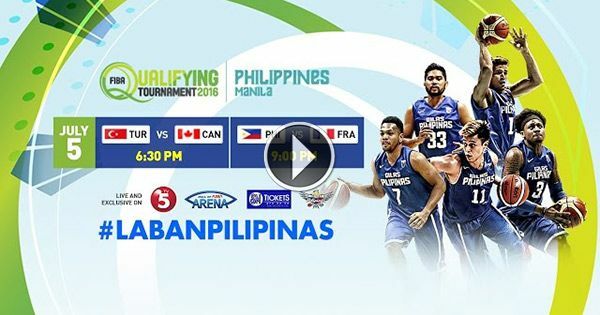 Philippines men's national basketball team Gilas Pilipinas will play against France in a FIBA olympic qualifier. Watch the live stream and later the replay video here. Tickets for the game, which will be aired Tuesday night from the Mall of Asia Arena, were already sold out, but thanks to Sports5, a live steaming video will be available on YouTube. The Philippines last fought France in 2014 during a pocket tournament in Antibes. The coach and players were different back then so it's exciting to find out if Gilas Pilipinas will give the visiting team a good fight especially that President Rodrigo Duterte is expected to watch. The presence of the chief executive will surely inspire the team led by naturalized center Andray Blatche, San Miguel star player June Mar Fajardo, and Asia's best point guard Jayson Castro in their quest for victory. France, on the other hand, has NBA players Tony Parker and Boris Diaw as well as Eurobasket Finals MVP Nando de Colo in its roster. A replay video will also be provided after the game.